Jane is rightly known for her fearless use of color as an inspirational element in her art quilts. From the bold colors of her geometric to the soft, summery tones of her Willow quilt, color is a major tool in her quilting toolbox. Yet even her most colorful quilts feature the use of silhouette and black contrasting backgrounds. For the past several years, Jane has been toying with more elemental shapes in her quilts while considering even more monochromatic works. "I have been dreaming of making some dramatic and very stark quilts with oversized elements but it has taken me a while to get the courage to get rid of the details which are such an enticing part of quilting." "Garden of Shadows is the first piece to get close. Fussy embroidery has been sacrificed for drama. I wanted to create the direct emotional power of Black and White woodcuts of Mexican and Polish and Early American cut paperwork." At seven and a half feet long, Garden of Shadows sheer size adds to its impact. The size of the quilt, the boldness of the motifs and the stark contrast of the elements combine to create a very dramatic statement and makes us anxious to see what's next! 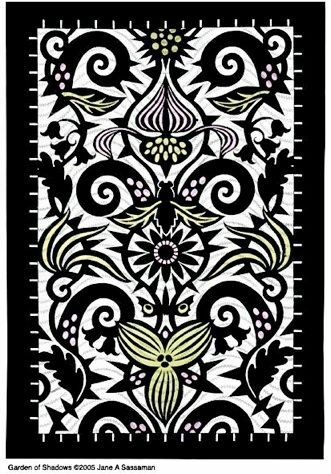 Although the starkness of the quilt may be a bit of a departure from Jane's usual use of color, the motifs of the thorn, the spiral, the seed and the butterfly wing are not.